Table 1. Hg 4f7/2 binding energy values . Hg 4f7/2 - 4f5/2 splitting is 4.05 eV. 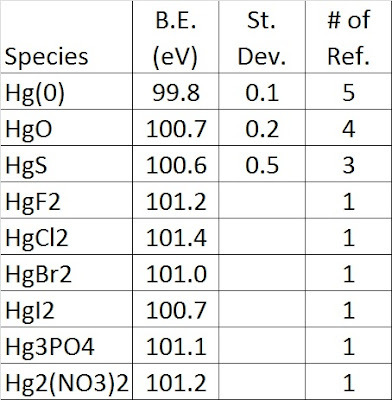 A HgO standard sample gave a Hg 4f7/2 binding energy of 101.5 eV with C 1s (adventitious) set to 284.8 eV. The Hg 4d5/2 was at 359.4 eV, Hg 4d 3/2 was at 378.8 eV, O 1s at 529.7 eV. shows HgS at 101.0 eV. C.D. Wagner, A.V. Naumkin, A. Kraut-Vass, J.W. Allison, C.J. Powell, J.R.Jr. Rumble, NIST Standard Reference Database 20, Version 3.4 (web version) (http:/srdata.nist.gov/xps/) 2003. J.F. Moulder, W.F. Stickle, P.E. Sobol, K.D. Bomben, Handbook of X-ray Photoelectron Spectroscopy, Perkin-Elmer Corp, Eden Prairie, MN, 1992.